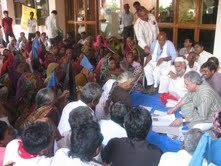 The oustees, a large number of them women, representing the adivasis-farmers, fish workers, potters, landless persons from the districts of Badwani and Dhar today stormed into the NCA’s office and challenged the illegal submergence, prior to their lawful rehabilitation as per the Narmada Award, State Rehabilitation policy, Judgements of the Supreme Court and the Action Plans. They questioned the Director, as to how can the NCA approve the submergence of 45,000 families residing in the submergence area of SSP, in the 193 villages of Madhya Pradesh, yet to be fully rehabilitated, as per law. From village after village people complained that their names have been left out of the official lists, they have not yet been provided alternative cultivable and encroached land, potters have not got land on the river bank, fish workers have not got the right to fisheries, landless have not been ensured alternative livelihood, many are yet to be given house plots and amenities at the R&R sites etc, the plots at many places are in deep pits, needing lakhs of rupees filling cost etc. etc. Thus, in such a circumstance, the dam-induced flooding leading to destruction of standing crop on thousands of hectares land and devastation of more than 2,000 houses, is absolutely illegal. Houses of hundreds, both kuchcha and pucca have been razed to the ground, walls and asbestos roof tops have fallen off, household belongings such as food grains, fodder, fire wood, fishing nets, motor pumps, small boats etc. have been washed away and a few thousand oustees’s rights have been violated. All of this is utter violation of the binding clause of the NWDTA, which states in no unclear terms that there shall be no submergence before full rehabilitation. The oustees threw a volley of questions to Mr. Ahmed and also to Mr. Asif, Deputy Director and other officials of the NCA. They stated that except for few small puri and chillies for a couple of days, no concrete relief has been provided, whether support in terms of rations (except 50 kgs wheat, after hundreds approached the Badwani CEO), assistance for transport of materials etc. On the contrary, NVDA claims to spend crores of rupees on so-called relief ! One of the most serious issues raised was also of the flawed back water levels, (BWLs) which has been exposed by the dam-induced floods this year. People questioned the report of the NCA, which reduced the BWLs at some places even below the Full Reservoir Level (FRL). While there is no finality of the levels to this date, the arbitrary manner in which the NCA has excluded 55 villages such as Khalghat, Kasravad, Mandwada, Selamda etc and Dharampuri township is completely illegal since these very villages and even Dharampuri has faced the back lash of submergence this time. The Expert Committee of MoEF has already refused the NCA’s reduced BWL and the oustees demanded that in the light of this report and the present submergence, NCA must withdraw the Report on the ‘Revised BWLs’ and conduct fresh accurate surveys, as per NWDTA, in a time-bound manner, including all the nallahs (drains), tributaries etc, by involving the affected people and villages in this process. After heated discussions, Dr. Ahmed accepted that the submergence that has been caused in the case of PAFs who have not yet been rehabilitated is illegal and the NVDA and NCA will have to take full responsibility for the same. He said that he will ensure that the state government records the losses and provides compensation for the submergence. Earlier in the day, groups of oustees in large numbers approached the office of the Chairperson, Grievance Redressal Authority. After 3 hours of arguments between NBA and NVDA, Hon’ble Justice S.P. Khare, who patiently heard the PAFs from various villages directed that the NVDA will have to provide interim relief to all those oustees who have not been not been given possession of the land. He also accepted the village-wise applications, Panchanamas, given by the PAFs and assured them that the complaints and grievances placed would be looked into. The NVDA was directed to file its reply in all these cases and the matter has been posted on 22nd October. Both at the level of the NCA and GRA, at the legal and field level, the struggle to seek compensation for the illegal submergence and rehabilitation shall continue.